The rapid disappearance of the Everglades marsh rabbit may be attributed to a single cause: the Burmese python. Although these rabbits found in Everglades National Park aren’t exactly high ranking on the food chain, their rapid disappearance is unusual, faster almost than they can reproduce. They are native to the park but have been declining over the past decade for reasons that were unclear for some time. The disappearance does, however, coincide with an invasive species that has done quite well in Florida. The Burmese python, as its name suggests, is indigenous to Southeast Asia, but was introduced to the United States through the pet trade. Due to its inviting climate, evidence suggests that they may have established breeding populations in Florida as far back as 1979, the descendants of snakes that got to be too large for their owners to care for. The snakes typically grow to be up to 12 feet long. Many of the earliest python sightings, some which ended up as roadkill, coincided with the layout of Florida’s Interstate-75, suggesting a pattern of where they had been released. The population really exploded with the advent of Hurricane Andrew in 1992, when a number of snakes escaped into the wild, leading it to officially become recognized as a breeding population by the year 2000, with a conservative estimate of 30,000 living in the swamps. The snakes were already suspected to be responsible for the Everglades’ loss of tropical bird species, and by January 2012, the import of these snakes was effectively banned. Picking up the pieces has still been a point of contention among scientists and conservationists. To keep track of the rabbits, researchers fitted 26 of them with collars and let them loose in the park in the fall of 2012. At this time, they suspected that populations of snakes increasing coincided with the loss of the rabbits. Sure enough, the experiment confirmed what researchers feared – with over 3/4 of the rabbits being eaten by pythons when the temperature warmed up. Not only were their fears reaffirmed, they indicate a much greater problem, that the pythons consumed the rabbits even faster than they were able to reproduce. “None of us would have predicted that 77 percent of the rabbits would be eaten by pythons,” said Robert McCleery, one of the study’s co-authors, from the University of Florida. The Burmese pythons have no natural enemies, only sometimes competing with the American Alligator when the two share territory, but this is quite an epic evolutionary battle already. Alligator populations have only successfully been stabilized over the last two decades, coming back from near extinction. In late 2005, a wildlife photographer came across the remains of one gruesome encounter between an oversized python and a full grown alligator. 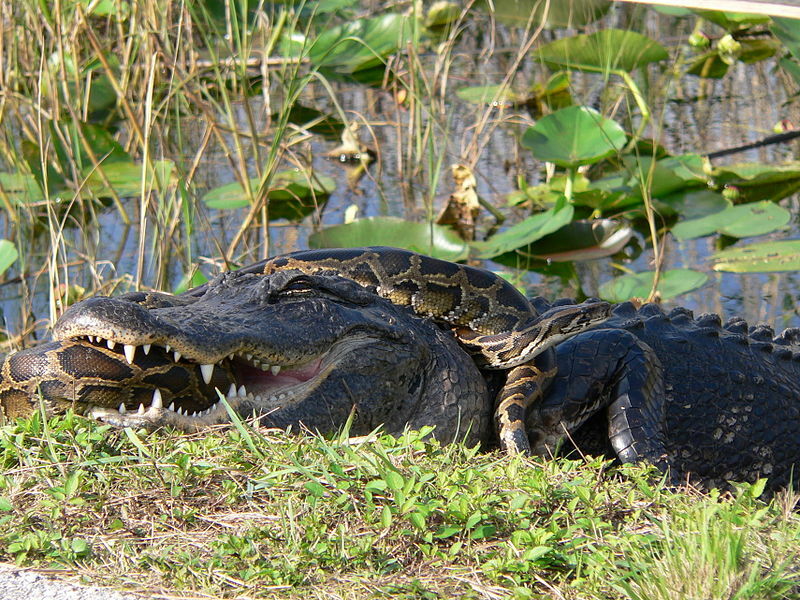 The gator was swallowed alive by the python and later sped up its heart rate (alligators can slow their heart rate to two beats per minute, allowing them to play dead and hibernate for up to a year at a time), allowing it to burst through the giant snake’s stomach, and in doing so, killing them both. McCleery is cautious in not blaming the pythons directly for the losses of small animals throughout the park, but thinks that his study makes it clear that the python species is a problem. Worse, they do not restrict their diets, so they could just as easily choose rabbits or other mammals as a food source. Nor is it the only species that settled in the park. Increasing numbers of the more aggressive African Rock Python, also a pet trade staple, have been reported, as have Nile Monitor Lizards, who have an increasing number of breeding populations in Florida. Clearly, there is a great deal of concern for the smaller mammals found within the park. The rabbits were caught near storm water treatment facilities outside the park grounds and then re-released into the park after they had been fitted with trackers. The research team then checked on the rabbits every two days, searching them out in the park. If they stopped moving for over six hours, a sensor would alert the team. In 16 of the 17 alerts, the trackers were led directly to large snakes. The 17th had actually been regurgitated by a snake, confirmed by DNA evidence. How this finding could help in managing the snakes remains unclear. Hunting and trapping is the typical way to keep down the numbers of invasive species, but researchers like Falk and McCleery are worried that this could be more trouble than its worth – inviting hunters into the Everglades which already has a fragile ecosystem and rapidly diminishing habitats.